Issue 6 of SRSP–307.7 has been released to incorporate refinements to the minimum antenna characteristics and emission limits. This SRSP replaces SRSP–307.7, Issue 5. 1.1 This Standard Radio System Plan (SRSP) states the minimum technical requirements for the efficient use of the band 7725–8275 MHz by low, medium and high–capacity (LC, MC and HC) point–to–point radio systems in the fixed service using digital modulation. 1.2 This SRSP is intended to be employed in the design and specification of radio systems and equipment, and in the evaluation of technical applications for new radio facilities or modification to radio systems submitted in accordance with the current issue of Radio Standards Procedure 113, Application Procedures for Planned Radio Stations Above 960 MHz in the Fixed Service (RSP–113). 2.1 This Standard replaces SRSP–307.7, Issue 5. Revision of this SRSP will be made as required. 2.2 Radio systems conforming to these technical requirements will be given priority in licensing over non–standard radio systems operating in this band. 2.3 The arrangements for non–standard systems are outlined in Spectrum Utilization Policy, General Information Related to Spectrum Utilization and Radio Systems Policies (SP Gen). 2.8 The use of a two–frequency plan is required. Where reasonable economic or technical justification is provided (e.g. where siting prevents adequate antenna discrimination), extra frequencies may be used to resolve the problem, subject to the provisions of Section 2.4. The radio frequency channel arrangements defined in this Standard provide for six different RF channel bandwidths. Channel pairs are provided with a common transmit/receive separation of 300 MHz. See Table 3 for RF channel frequencies. The frequencies assigned to a main route system should be re–used where possible on the branching or spur routes. The siting of repeater stations should be planned with this requirement in view, in order that sufficient antenna discrimination is obtained at the branch–off angle. New systems using 10 MHz or smaller channel plans should use the lowest available frequency pair that can be successfully coordinated. New systems using the 20 MHz or 30 MHz channel plans should use the highest available frequency pair that can be successfully coordinated. 4.7.1 High and medium–capacity digital systems submitted for licensing shall have a minimum spectral efficiency of 4.4 bits/s/Hz of the RF channel bandwidth on a single polarization. 4.7.2 Low–capacity digital systems submitted for licensing shall have a minimum spectral efficiency of 2.4 bits/s/Hz of the RF channel bandwidth on a single polarization. 4.8.1 One protection channel will normally be permitted for systems with more than one working channel. 4.8.2 Quad–path diversity applications will be considered on a hop–by–hop basis to solve special propagation problems. 5.1 The transmitter power delivered to the antenna input should not exceed the limits per RF channel shown in Table 1 below. 5.3 The centre frequency of the emission shall be maintained within ±0.002% of the assigned frequency. 2. Attenuation greater than 80 dB or to an absolute power of less than –13 dBm/MHz is not necessary. 6.1 The co–polarized radiation pattern envelope in the horizontal plane of the antenna must remain within Envelope A defined in Table 2 and shown in Figure 1, for both vertical and horizontal polarizations. 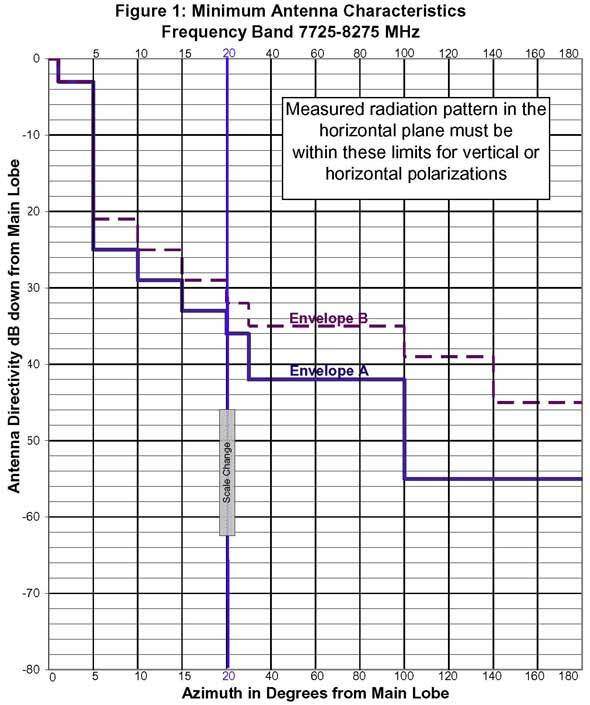 6.2 In uncongested areas, the co–polarized radiation pattern envelope in the horizontal plane of the antenna must remain within Envelope B defined in Table 2 and shown in Figure 1, for both vertical and horizontal polarizations. Where practicable, sites for transmitting terrestrial stations in the fixed service, and employing maximum values of e.i.r.p. exceeding +35 dBW in the frequency band 7725–8275 MHz, should be selected so that the direction of maximum radiation of an antenna will be at least 2° away from the geostationary–satellite orbit, taking into account the effect of atmospheric refraction. Spectrum Utilization Policy 1–20 GHz, Revisions to Microwave Spectrum Utilization Policies in the Range of 1–20 GHz (SP 1–20 GHz), January 1995, contains spectrum utilization principles including the Geographical Differences Policy guideline. This information will be incorporated into a revision of SP Gen.
For the purpose of this SRSP, "harmful interference" means interference that endangers the functioning of a radionavigation service or other safety services or seriously degrades, obstructs, or repeatedly interrupts a radiocommunication service operating in accordance with regulations and technical requirements laid down by Industry Canada under the Radiocommunication Act.